Q: How does a truck accident case differ from an auto accident case and why is it best to choose a specialty attorney? A: The rules that determine who is at fault for the truck accident are the same as for auto accidents. However, there are laws and rules that specifically apply to trucking companies. While handling your case we employ the knowledge of how the trucking accidents typically occur, the jurisdiction issues regarding the most appropriate venue for the injury victim, the types of claims that are brought against the trucking companies, and the nature of the investigation required by the truck accident lawyer. We will do our best at obtaining the fair compensation in your case. Q: If I was partially at fault for the collision with the truck, can I still win the case? A: The answer will depend on the degree of your fault. According to the legal document of “comparative negligence”, the amount of another party’s liability for the collision is set by comparing his negligence with your own. The other party’s portion of liability is what determines the percentage of the resulted damages he has to pay. 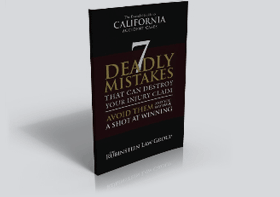 California is a pure comparative negligence state, which means you can recover damages even if your share of the negligence is greater than 50%. Let us evaluate your accident and determine if you have a strong legal case against a trucking company, call our office today. Q: Can I sue the trucking company for the injuries incurred by their driver? A: Depending on the relationship between the truck driver and the company you may be able to sue the trucking company. If a relationship between the two is found, then the company is legally liable for the negligence of a driver. Sometimes in truck accident cases trucking companies are found liable for not screening out bad drivers properly. Establishing the liability of the company becomes problematic when a truck driver is an independent contractor. Failure to properly inspect and maintain the truck could also be a fact we would look for in your case. If the relationship between the driver and the company is not found, then you are still entitled to the compensation from the truck driver’s insurance company. Your injuries must be compensated for one way or another. Don’t let the absence of that relationship between the driver and the trucking company misguide you. Please contact the Rubinstein Law Group today to schedule your free truck accident consultation. Mr. Rubinstein serves clients in San Marcos, Carlsbad, Oceanside, Vista, and Escondido, California. Call (760) 804-2790 if you need a San Diego truck accident attorney, or have a case in Southern California. We can come to you.